Directioners! Here’s your opportunity to watch your ultimate crushes live on stage. 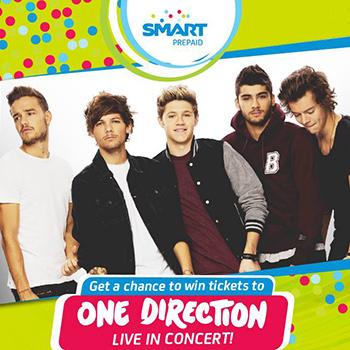 Join the Smart Win One Direction Concert Tickets Promo and get a chance to win 2 Gold Tickets to see the international pop sensation perform their chart-topping hits live in Manila. To qualify, you need to register and avail Smart Prepaid promos and load services to earn entries. A total of 700 winners of tickets to the concert of One Direction will be given away! It’s a once-in-a-lifetime opportunity to be a part of the country’s biggest music event for 2015 so load up now to gain more entries and increase your chances of winning. 1. Register for FREE, simply text REG <NAME, ADDRESS> send to 316. 3. Register for their raffle entries to qualify to the monthly draws. Visit us again for the lucky winners of Smart Win One Direction Concert Tickets Promo and more updates on the latest Smart Load offers. You can also check on Smart Communications Facebook Page for their latest news feed.